This five-tier library is so elegant and graceful with its soaring atrium, huge columns and wrought iron balconies, that it has been called ‘Cathedral of books’. 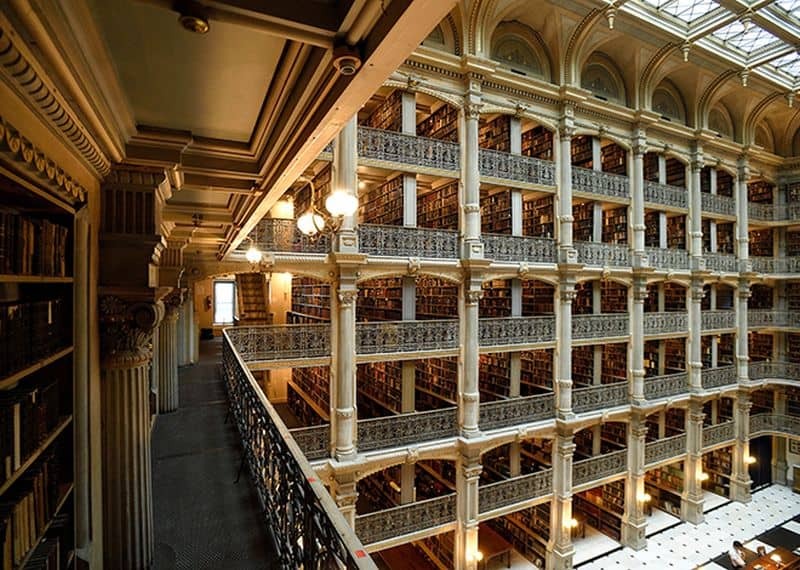 It’s one of the best libraries in the US and considered to be one of the most gorgeous too. Bibliophiles browse 18th-19th century archaeology tomes along with the huge collection of books in the library. Sou Fujimoto designed this building, which proclaims to the world that it is a library – this is due to the glass walled bookshelves forming the exterior. The architect’s vision was to create a visual book forest and a tribute to the enduring power of books. This stunning library building is definitely one of the coolest libraries in the world. The Neo-Modernist design is visually astounding and is commonly known as the Black Diamond. The black granite, steel and glass structure treats visitors to amazing views of the Harbor. The ceiling fresco by Per Kirkeby adds to the beauty of the interior. The architect Grosvenor Goodhue, who also included ancient Egyptian elements, built the building along Gothic lines. The lobby’s remarkable murals were painted by Dean Cornwell and imbue a stately charm to the library. 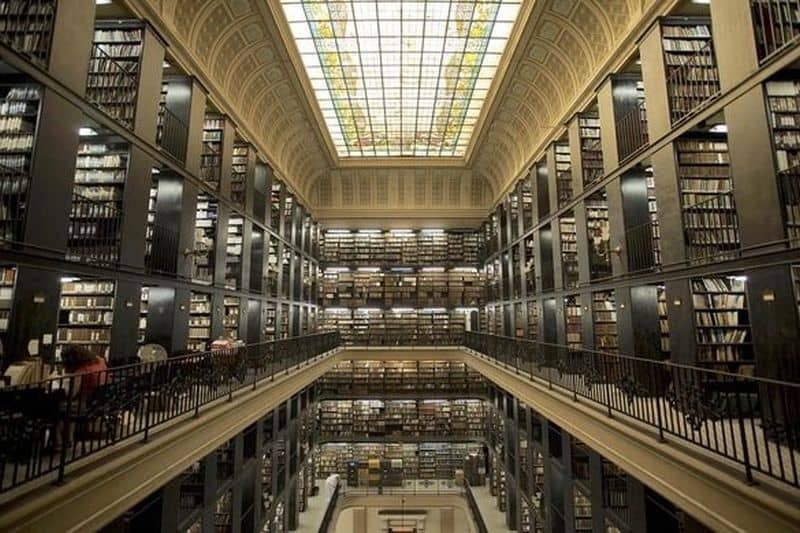 If you’re ever in Rio de Janeiro, you just have to visit the National Library. It contains 9 million items including thousands of photos. This enviable photo collection is on UNESCO’s Memory of the World Programme, due to the significance of the photos. The library’s ornate design is magnificent and the design of the building is in the Art Nouveau and Neoclassical style. 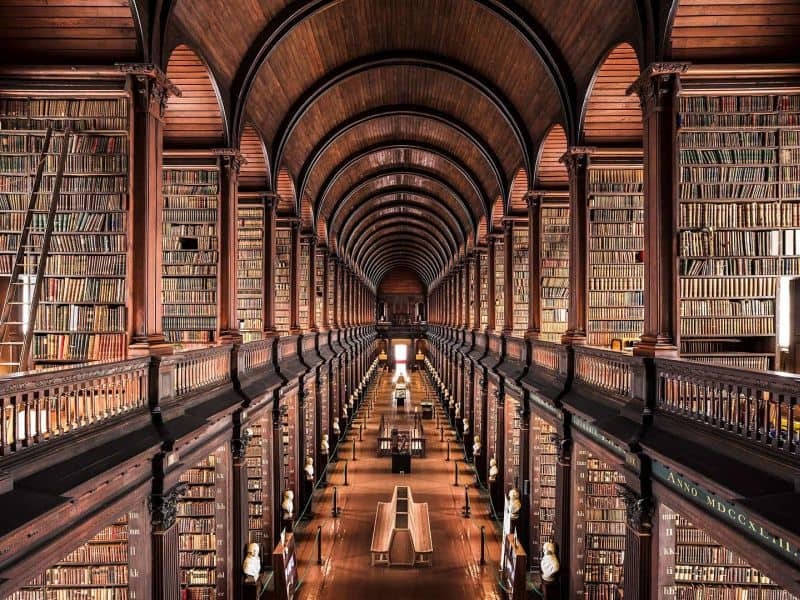 This is one of the world’s most beautiful libraries. An ingenious design using recycled materials, the glass-fronted cube like structure is spectacular. There is a red cube inside the building too, which accommodates the books. A striking contrast to the ornate building design of the National Library of Brazil is one of the coolest libraries in the world – the Macquarie Library displays cutting edge modern design. It has Australia’s first Automated Storage and Retrieval System (ASRS). The system uses robotic arms to pick books up and places them at the front desk. 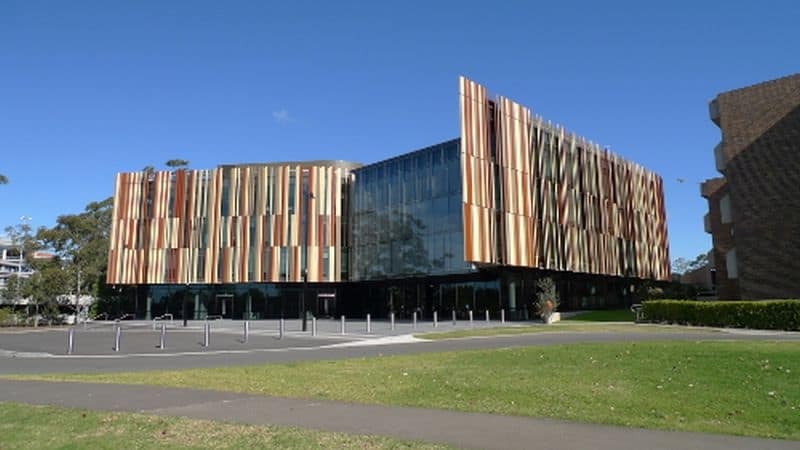 It’s a green building made from recycled construction material and has a biophilic design to allow visitors enjoy reading in a simulated natural collection. Geisel library is named after and dedicated to one of the world’s most loved authors – Theodor Seuss Geisel, who you may know as Dr.Seuss. The library honors his wife Audrey Geisel as well, for her contribution to literature. Made in the brutalist style of avant garde architecture by the renowned architect William Pereira, it is eight stories high and a marvelous example of modern architecture. 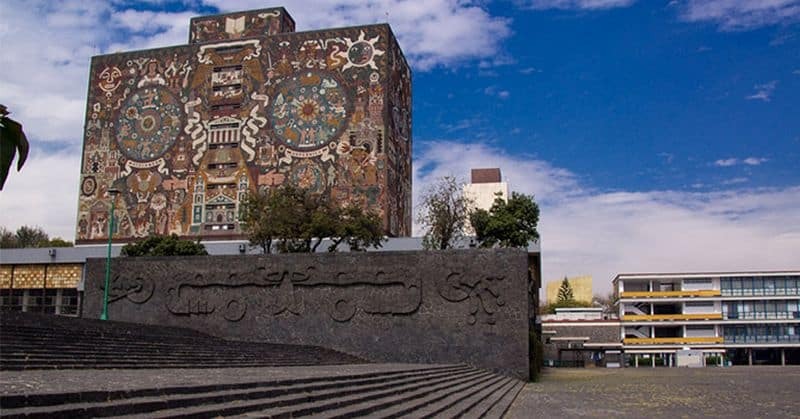 This impressive building is one of the most famous libraries due to the magnificent exterior murals, designed by the Mexican painter-architect Juan O’Gorman. The fascinating mural tells the story of Mexico in a most beautiful manner. 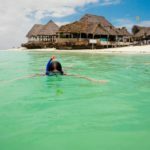 The murals are not painted, but they have been painstakingly made from bright colored stones. A must-visit for all book-worms! Birmingham Library’s façade is a tribute to the jewelry quarter of the city. It has an intricate design of 5,357 metal rings that contributes to its unique beauty. The wooden paneled Shakespeare Memorial room is in a traditional style and the collection of first editions of the Bard’s volumes is the added attraction of this library. This is a library which you must visit just to see and wallow in the texts of yore- the library contains 200,000 of the world’s oldest books. Of course, you have to take a look at the ‘Book of Kells’, the 9th century embellished Gospel book. The 213 ft chamber is decorated with the marble busts of philosophers, writers and patrons of the library. This world’s most beautiful libraries has nine stories and appears like a monolithic cube. The façade’s glass bricks glow a magnificent color in the sunset, and at night, blue lights illuminate the building. Here, in the upside down pyramidal space, the lights are on all night, and the library welcomes book lovers at all hours of day and night. 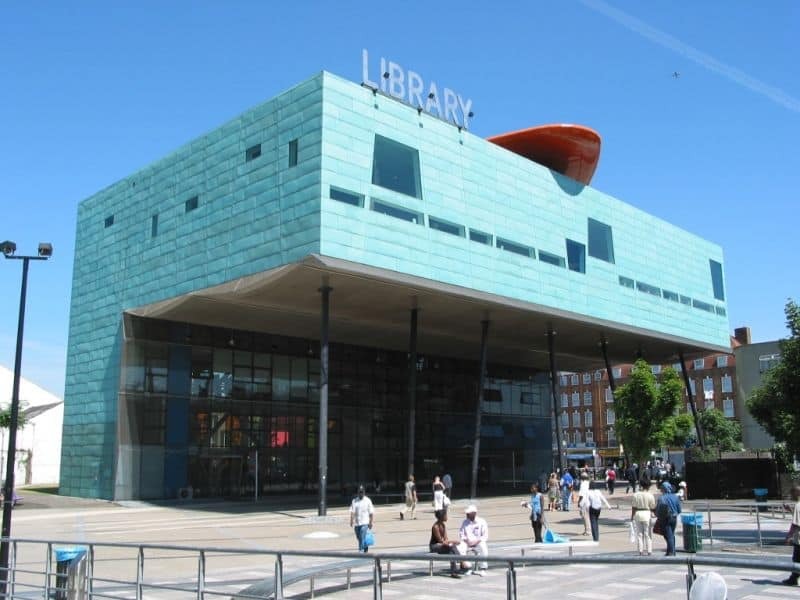 This is one of the world’s most beautiful libraries and has the distinction of being a structure that boosts the morale of people. The splendid ultra modern design of the building is a rich combination of colored glass, steel and copper, which makes it stand out from its surroundings. A baroque architectural wonder, the library is made of delicate arches, carved wood and ornate, gilded patterns. There are Chinese motifs too in the lacquered and gilded shelves. Though it is very beautiful, it has a dark past, as it used to be a prison for students and scholars. The Marciano is one of the oldest libraries in the world and is also most famous libraries in Italy. 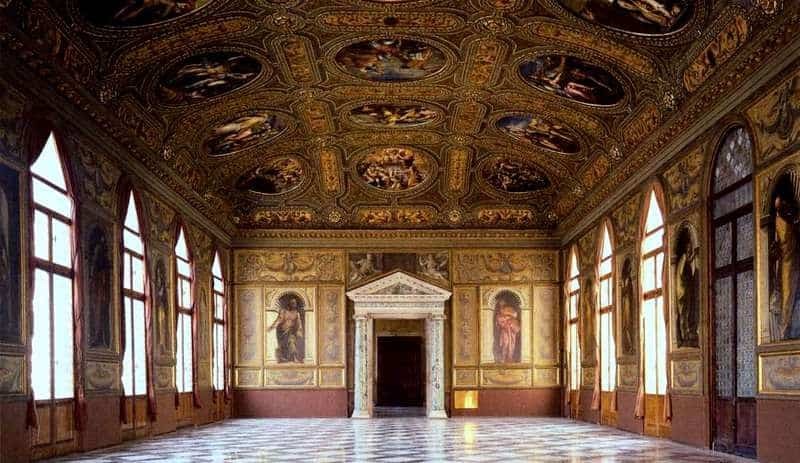 The works of Alessandro Vittoria, Tintoretto and Titian adorn the interior ceilings and walls. 750,000 books, 24,000 prints and 13,000 manuscripts belonging to the 17th century can be viewed here. It’s counted as world’s most beautiful libraries and every book lover definitely put it on his bucket list. Some other world’s most beautiful libraries are the Austrian National Library, Bodleian library, The Clementinum and Mediatheque Sandro Penna. All who visit admire the grace and elegance of the libraries, and bookworms should definitely put them on their bucket list.